This Leavenworth Paper chronicles the introduction of chemical agents in World War I, the U.S. Army’s tentative preparations for gas warfare prior to and after American entry into the war, and the AEF experience with gas on the Western Front. Chemical warfare affected tactics and almost changed the outcome of World War I. The overwhelming success of the first use of gas caught both sides by surprise. Fortunately, the pace of hostilities permitted the Allies to develop a suitable defense to German gas attacks and eventually to field a considerable offensive chemical capability. Nonetheless, from the introduction of chemical warfare in early 1915 until Armistice Day in November, 1918, the Allies were usually one step behind their German counterparts in the development of gas doctrine and the employment of gas tactics and procedures. In his final report to Congress on World War I, General John J. Pershing expressed the sentiment of contemporary senior officers when he said, “Whether or not gas will be employed in future wars is a matter of conjecture, but the effect is so deadly to the unprepared that we can never afford to neglect the question.” General Pershing was the last American field commander actually to confront chemical agents on the battlefield. Today, in light of a significant Soviet chemical threat and solid evidence of chemical warfare in Southeast and Southwest Asia, it is by no means certain he will retain that distinction. Over 50 percent of the Total Army’s Chemical Corps assets are located within the United States Army Reserve. 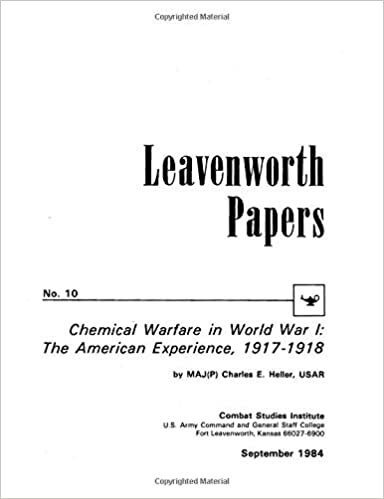 This Leavenworth Paper was prepared by the USAA Staff Officer serving with the Combat Studies Institute, USACGSC, after a number of requests from USAA Chemical Corps officers for a historical study on the nature of chemical warfare in World War I. Despite originally being published in 1984, this Leavenworth Paper also meets the needs of the Total Army in its preparations to fight, if necessary, on a battlefield where chemical agents might be employed.